Austin assistance police chief Ely Reyes says Tuesday night’s blast wasn’t related to bombings that have killed two people and severely wounded four others since March 2. He says there’s also “no reason to believe” this was a copycat incident. Reyes says that when Goodwill received the box, they decided it wasn’t appropriate for donation. While trying to dispose it, an employee handled one of the artillery simulators and it went off. The employee was treated and released. Artillery simulators are devices sometimes used in military training. Reyes says such military items are sometimes mistakenly donated to Goodwill rather than being properly disposed of. The latest explosion in Austin reminded Shahla Mohnandshaw of home, but not in a good way. Her husband works at the Goodwilll store where an incendiary device went off Tuesday night, injuring one man and further unnerving an already nervous Austin. Authorities say it wasn’t related to the recent bombings that killed two people and seriously wounded four others since March 2. Mohnandshaw was doing laundry at her apartment complex nearby when she heard helicopters and raced toward the store. Police and federal authorities say the latest explosion to hit Austin was caused by an “incendiary device” and is not related to the series of bombs that has rocked Texas’ capital city. The Austin Police Department and the U.S. Bureau of Alcohol, Tobacco, Firearms and Explosives said via Twitter that the blast Tuesday night at a Goodwill store in the southern part of the city wasn’t caused by a package bomb, as initially reported, but an incendiary device. One man in his 30s was injured and authorities evacuated a grocery store and shopping center nearby. But authorities insisted that the incident wasn’t related to five bomb blasts that have killed two people and severely injured four others since March 2. Austin authorities say emergency personnel are responding to another reported explosion, this one at a Goodwill store in the southern part of the city. Austin-Travis County EMS tweeted Thursday evening that at least one person was injured but that details about the severity of those injuries and the explosion itself were unknown. It would mark the sixth explosion in the Austin area since March 2. So far, two people have been killed and four others seriously wounded. In a statement Tuesday evening, the FBI said no one was injured when law enforcement responded to a report of a suspicious package at the facility around 6:20 a.m. Hours earlier, a separate package exploded at a FedEx shipping center in Schertz, about 60 miles (96 kilometers) south of Austin. The FBI said both packages were related to the other four bombings that have rocked Austin since March 2, killing two people and badly wounding four others. The chairman of the U.S. House Homeland Security committee says federal authorities informed him investigators have obtained surveillance videos in Austin that “could possibly” show a suspect in the package bombing at a FedEx distribution center near San Antonio. Congressman Michael McCaul told The Associated Press on Tuesday that he’s been briefed by the FBI, ATF and Austin police about the situation. But he adds that investigators are still poring through the surveillance recordings. Austin police earlier said another suspicious package was discovered at a second FedEx center near Austin’s main airport. McCaul says evidence obtained from that package if kept intact could be key in finding the bomber. FedEx says it has turned over “extensive evidence” to authorities after a package exploded at its processing center in the town of Schertz, south of Austin. In a statement, the company says “the individual responsible” for sending the package that blew up also shipped a second package that has been secured and turned over to law enforcement. A company spokeswoman subsequently refused to say if that second package might have been linked to a suspicious package that authorities seized at another FedEx shipping facility on Tuesday, this one in south Austin, near the city’s airport. Congressman Michael McCaul, a Republican from Texas, made the comments Tuesday at a White House roundtable discussion on so-called sanctuary cities. It’s not clear whether McCaul was speaking with knowledge of specific information in the case. A package exploded early Tuesday at a FedEx distribution center near San Antonio. Texas Attorney General Ken Paxton says the package was sent from Austin and was addressed to a home in Austin. Four other package bombs have exploded in Austin since March 2. An employee at a FedEx center in Austin says managers ordered workers outside before sunrise after a suspicious package showed up. Bryan Jaimes told reporters Tuesday he estimates there were about 60 people working at the facility near the Austin-Bergstrom International Airport when the building was cleared out. The 19-year-old package handler says workers left calmly and that he’s glad he made it out safe. He returned to the center hours later hoping to be allowed back in to get his car and phone. The facility remains closed. Jaimes says he never received new guidance from managers about handling packages as Austin authorities look for what they’ve called a “serial bomber.” He said his job is to load the trucks. The San Antonio Police Department says its police chief was mistaken when he said that investigators found a second package bomb that hadn’t detonated at a FedEx distribution center. The department says in a news release police Chief William McManus misspoke at a news conference earlier Tuesday and that there was only one package bomb at the Schertz facility — the one that exploded. It forwarded any inquiries to the FBI and Austin Police Department. Texas Attorney General Ken Paxton earlier told The Associated Press that there was a “suspicion” of another package, but he stopped short of confirming there were two. Officials say the package bomb that exploded early Tuesday apparently went out from a FedEx store in the Austin enclave of Sunset Valley and was addressed to an Austin home. It blew up on a conveyer belt at the FedEx ground center in Schertz, which is outside of San Antonio and about 60 miles (95 kilometers) southwest of Austin. Austin police say they’ve called the bomb squad to investigate a suspicious package at a FedEx shipping center outside of the city’s airport. Four package bombs have detonated in Austin this month, killing two people and injuring four others. A fifth that officials say was sent from the Austin area to an address in Austin exploded early Tuesday at a FedEx distribution center near San Antonio, where investigators found another parcel bomb that hadn’t exploded. Austin police say they’ve responded to more than 1,200 calls in the last two weeks from people worried that suspicious packages could be bombs. Police said Tuesday that they’ve responded to 1,257 calls since March 12, when packages exploded at two homes in Austin, killing a 17-year-old and injuring two others. On March 2, a 39-year-old man was killed when a package bomb exploded. On Sunday, a bomb triggered by a tripwire injured two men in a quiet neighborhood in southwest Austin. Police say that between 8 a.m. Monday and 8 a.m. Tuesday, they responded to 420 calls about suspicious packages. Officials say a bomb that exploded early Tuesday at a FedEx distribution center near San Antonio went out from an Austin-area FedEx store and was addressed to an Austin home. Investigators have closed off an Austin-area FedEx store from where officials say two package bombs were sent to a distribution center near San Antonio, including one that detonated. Authorities have roped off a large area around the shopping center in the Austin enclave of Sunset Valley where the store is located. Texas Attorney General Ken Paxton says the parcel bomb that exploded early Tuesday in the distribution center in Schertz was mailed from Austin and addressed to an Austin home. The police department in Sunset Valley, which is surrounded on all sides by Austin, says it appears that both package bombs that made it to the Schertz facility went out from the Sunset Valley store. Authorities suspect the parcel bombs are linked to the four bombs that have killed two people and injured four others in Austin this month. President Donald Trump is blaming a “very sick individual or individuals” for a series of bombings in Austin, Texas. Trump’s comments came hours after an early-morning explosion at a FedEx distribution center near San Antonio. Authorities say it was a bomb addressed to an Austin home that had been sent from Texas’ capital city. Investigators found a second bomb at the facility that hadn’t exploded. Authorities believe the latest parcel bombs are linked to the four bombings this month in Austin that have killed two people and injured four others. Texas’ attorney general says the package that exploded at a FedEx distribution center near San Antonio was sent from Austin and was addressed to a home in Austin. Attorney General Ken Paxton also told television station KXAN that a second parcel bomb that didn’t explode was found at the FedEx facility in Schertz. San Antonio police Chief William McManus told a news conference there that the second package was no longer at the facility. Authorities say one of the parcel bombs detonated at around 1 a.m. Tuesday while it was on a conveyer belt in the facility, which is about 60 miles (95 kilometers) southwest of Austin. One worker suffered minor injuries. Paxton didn’t provide details on where the packages were addressed to. Investigators believe the explosives are linked to the four bombings that have killed two people and injured four others in Austin this month. Authorities say the package that exploded at a FedEx ground facility near San Antonio was on a conveyer belt when it detonated. Schertz police Chief Michael Hansen said at a news conference that one worker reported feeling ringing in her ears after the early Tuesday blast, but she was treated and released. Hansen said that the intended target of the parcel bomb wasn’t the facility or anyone who lives in Schertz, which is about 60 miles (95 kilometers) southwest of Austin. But neither Hansen nor federal agents who spoke at the news conference would say where the package was sent to or from or give any other details about the investigation, saying it was still unfolding. An FBI spokeswoman, agent Michelle Lee, said earlier Tuesday “it would be silly for us not to admit that we suspect it’s related” to the four Austin bombings that have killed two people and injured four others since March 2. Austin police have deployed a hazardous materials squad to a FedEx shipping facility near the city’s airport to investigate reports of a suspicious package. It isn’t known yet if the suspicious package is linked to a bomb that detonated earlier Tuesday at a FedEx distribution center near San Antonio or the four bombs that have gone off in Austin this month. But the Austin Police Department says an investigation is underway. The package that exploded earlier Tuesday at the FedEx facility in Schertz, about 60 miles southwest of Austin, slightly injured one worker. Authorities believe it is linked to what they say is a serial bomber responsible for the four Austin bombings since March 2. Spokeswoman Sarah Huckabee Sanders tells Fox News Channel that President Donald Trump is aware of the situation. A heavy law enforcement presence is surrounding the FedEx distribution center near San Antonio where a parcel bomb exploded, slightly injuring one worker. The area around the facility in Schertz is heavily industrial and features warehouses and parking lots empty except for parked trailers. A woman who identified herself as an FedEx employee emerged from the shipping facility wrapped in a blanket as the sun rose on Tuesday and said she’d been evacuated. She declined to give her name. The FBI says a package exploded at the facility at around 1 a.m. on Tuesday. Authorities believe it is linked to the four bombs that have detonated in the Texas capital of Austin this month. Those bombs killed two people and injured four others. 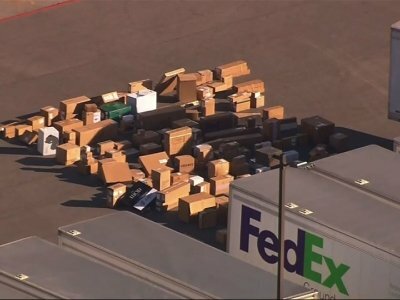 The Austin Police Department says it is aware that a parcel bomb exploded overnight at a FedEx distribution center near San Antonio and that it is working closely on the investigation with federal law enforcement agencies. An FBI spokeswoman, agent Michelle Lee, says it is still early in the investigation into the early Tuesday bombing at the FedEx facility in Schertz, which left one worker with minor injuries. But she says “it would be silly for us not to admit that we suspect it’s related” to the four Austin bombings that have killed two people and injured four others since March 2. The latest bombing in Austin injured two men on Sunday. Authorities say it was triggered by a tripwire and was a more sophisticated bomb than those used in the first three attacks, which were package bombs left on people’s doorsteps. The Austin police are again warning people to call 911 if they come across suspicious packages, bags or other items that look out of place. Federal investigators say a package that exploded at a FedEx facility near San Antonio is believed to be linked to the string of bombings that has terrified the Texas capital this month. Special Agent Michelle Lee of the FBI in San Antonio says she has no confirmed reports of any injuries in the blast. But the police department in Schertz, where the FedEx facility is located, issued a statement saying one person was treated at the scene and released. Lee says it is still early in the investigation, but “it would be silly for us not to admit that we suspect it’s related” to the four Austin bombings that have killed two people and injured four others since March 2. The latest bombing in Austin injured two men on Sunday. Lee didn’t have details about the size, weight or description of the package. Federal agents tell The Washington Post that a package bomb exploded around 1 a.m. Tuesday inside a FedEx distribution center in Schertz, Texas. Spokeswomen for the FBI and the ATF say both agencies are at the scene. The explosion happened at the facility just northeast of San Antonio sometime around 1 a.m., said FBI Special Agent Michelle Lee. ATF spokeswoman Nicole Strong said that early indications are that no one was injured. A website that monitors fire and police activity in San Antonio, Texas, says a package bomb has exploded at a FedEx distribution center in Schertz, Texas, hurting 1 person, a FedEx employee who apparently suffered a non-life-threatening “percussion-type” injury from the blast. The FBI and ATF are at the scene. Federal agents say this package is likely linked to attacks by what they believe is a serial bomber. The package exploded shortly after midnight on Tuesday. The Associated Press reported erroneously earlier Tuesday that the San Antonio Fire Department said one person had suffered a non-life-threatening “percussion-type” injury from the blast. That information came from SanantonioFIRE, a local media website that reports on local police, fire and emergency service news, and could not immediately be independently confirmed. Police and federal agents said Sunday night’s blast triggered along a street by a nearly invisible tripwire suggests a “higher level of sophistication” than they have seen before in three early package bombs left on doorsteps, and means the carnage is now random, rather than targeted at someone in particular. William Grote says the attack, by a suspected serial bomber that has terrorized Austin for weeks, left what appeared to be nails embedded in his grandson’s knees. Two people are dead and four injured, and authorities don’t appear closer to making any arrests in the four bombings that have rocked the capital city. Authorities haven’t identified the latest victims, but Grote told The Associated Press that his grandson was one of the two men wounded in southwest Austin’s quiet Travis Country neighborhood. They suffered what police said were significant injuries and remained hospitalized in stable condition.